It feels inferior in comparison to Hali's Directive to me. It's not a Disrupt, so they still get the character ability, and if they had to exhaust, return to hand or go insane, it won't be worth using against them. The best person to use this on would be Lena Di Boerio, so she can't steal anymore icons, and loses the one she stole, only leaving her with the +1 skill. 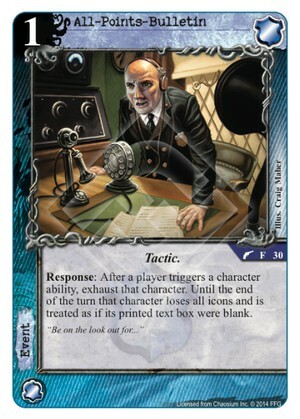 It is weaker then Directive but Hastur is also the king of cancel it is still not a bad card for agency. Hali's Directive also doesn't do much to characters that cannot be made insane. Exhausting and especially blanking is universally useful. Danigral - 2 out of 5. I don’t see the two effects it has (exhaust, and lose icons and blank) as especially synergistic with each other. Instead it seems that one or the other would be helpful: either you can keep a character out of stories that turn, or you can try to hit it while it’s at stories (anti-Peter Clover maybe???) There are some cases where this might be handy, but usually you’ll just wish you had a card that did more. mnBroncos- 1 out of 5. Is a fine card but the fact that it doesn’t actually cancel the effect I don’t see room for this in a deck. Obtuse - 1 out of 5. Maybe you can use this in your Agency/Hastur mashup? Big maybe. livingend - 1 out of 5. All-Points-Bulletin is sort of a poor man’s Hali’s Directive. And by poor I mean poverty-stricken; it doesn’t even cancel the ability. The rest of the effect, a seemingly haphazard collection of soft control effects, doesn’t salvage it either. Blanking a character that just triggered its ability is pretty much pointless. Exhausting the character is okay-ish if it happens during your opponent’s operation phase. Removing icons is probably the most powerful part here, but that requires your opponent to trigger a character ability on an important participating character after his or her commitment step. And generally speaking, relying on your opponent to act in certain ways for your cards to work is not where you want to be. Verdict: More like No-Points-Bulletin, amirite? WWDrakey & Ire - 1 out of 5. See above for review on Mano-a-Mano, and our view on conditional effects. Then, add to that the fact that APB really doesn’t do much, even in the best of cases.